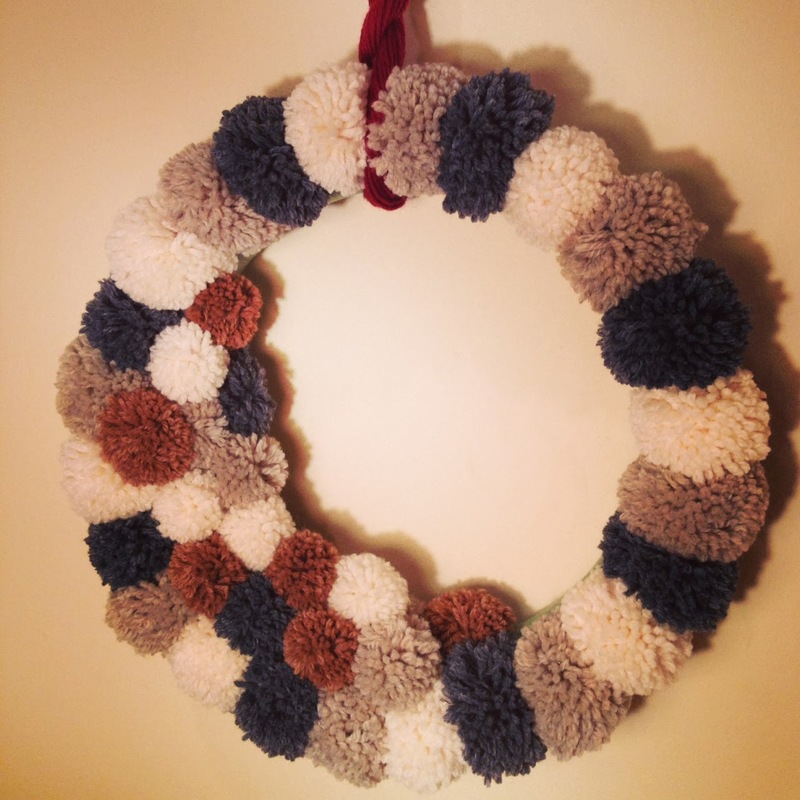 Stashbuster: Cozy winter yarn wreath | Cobberson + Co. This winter, one of my main goals has been to find projects that would use up my giant box of yarn odds & ends. After being inspired by all the gorgeous yarn ball wreaths on Pinterest, I figured a winter yarn wreath would be perfect for stashbusting. Instead of yarn balls, I decided to do pom poms, partly because it seemed fluffy and cozy during ye olde polar vortex, and partly because I always wanted one of those little pom pom makers. There were a bunch of natural colored single skeins in the box, so I chose white, charcoal gray and and two different mid-tone browns. This project would also look adorable in different shades of white, or reds for Valentine’s Day. Pretty much any monochromatic winter color palette would work. really surprised and nervous I was going to run out. 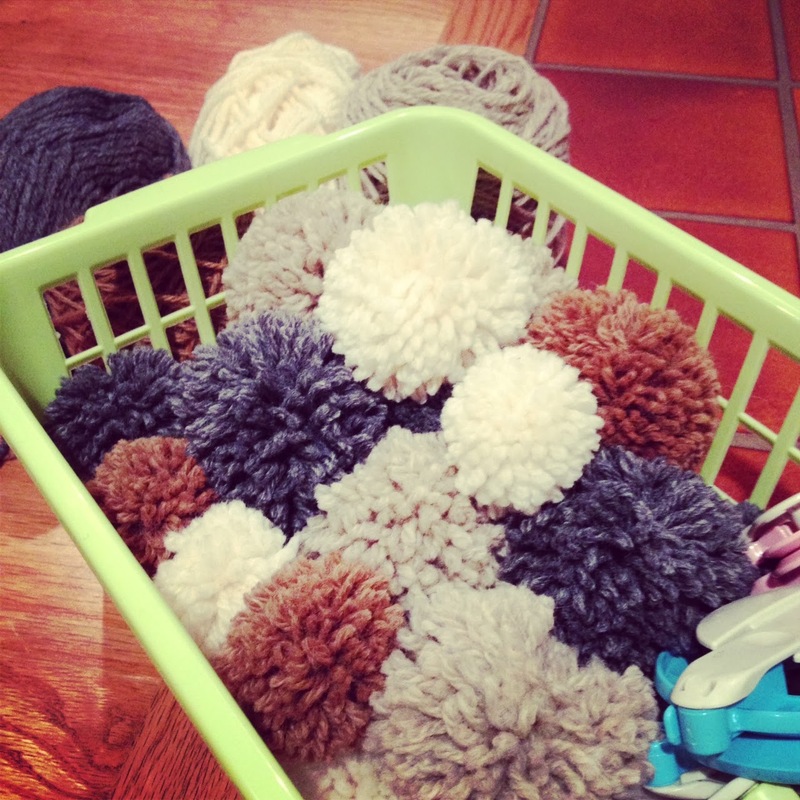 I made eight medium sized poms each on gray, white, and beige-y brown, and six small poms each in all four colors. The one shade of brown was so rich, it seemed better suited as an accent color, rather than using it all over. Once all the poms were finished, I just hot glued them to a styrofoam wreath form using low temperature glue, and twisted some cranberry colored worsted weight wool to look like a skein for hanging the wreath. In other projects, I’m sloooowly embroidering Tillie to hopefully use as my new blog banner. 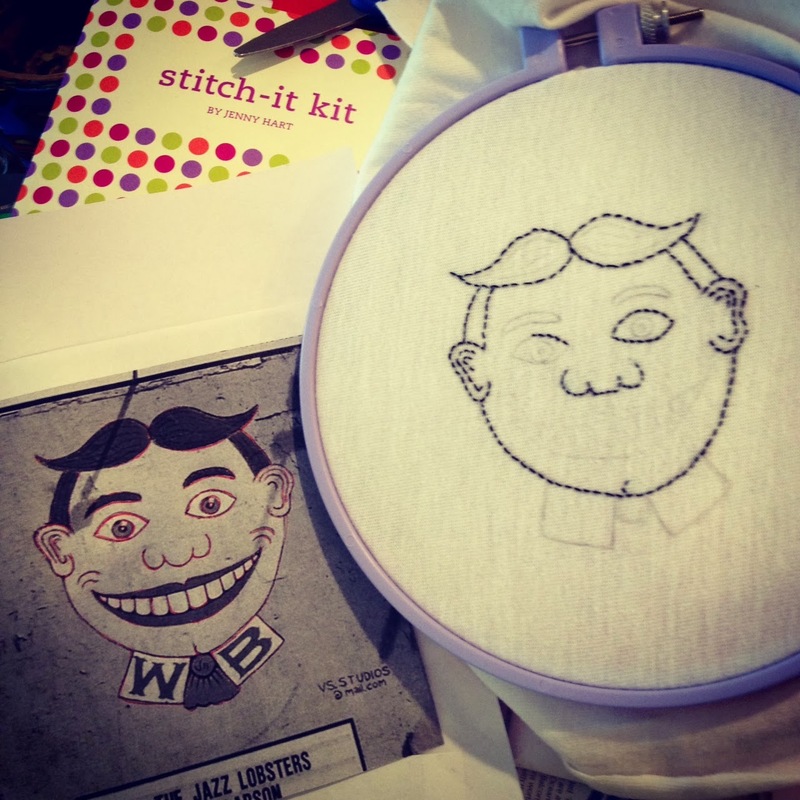 It’s my first time embroidering something- so far I’m enjoying the process. I’m also working on some new printable handmade project wrappers and tags (and yes, there will be one for crochet!). The response to the handknits tag was overwhelming, so thank you all so much for your kind words here and on Pinterest. I’m so thrilled you liked it! Valentine’s Day crafting is also in full swing over here- felt heart garlands and Mod Podge gift boxes are in the works. Finally, Cobberson & Co. was mentioned in Booskerdoo Coffee Company’s 2013 review round up! My original post can be found here. Please head over to the shop and give these guys some love- great coffee from a great local business. Enjoy your snow day and happy crafting! Previous Post Five perfect snow day DIY projects! What a pretty wreath. It looks like a lot of fun! Very creative. My husband gets annoyed because I always forget to change our wreath so ours stays on for about 10 out of 12 months… Whoops! Nice to meet you. Visiting via SITS on facebook.